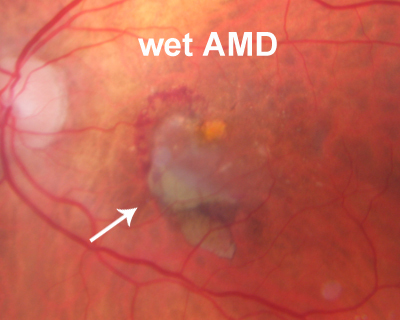 Wet AMD occurs when abnormal blood vessels grow under the retina and leak causing vision loss. What is a Choroidal Neovascular membrane? 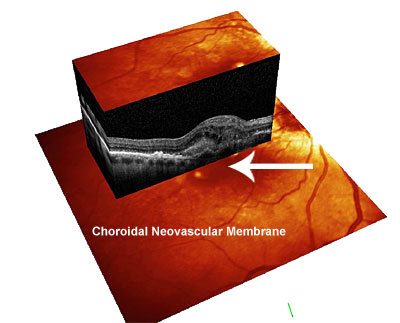 Choroidal neovascular membranes are new blood vessels that grow beneath the retina and disrupt vision. These blood vessels grow in an area called the choroid, the area between the retina and the sclera (the white part of your eye). The choroid supplies oxygen and nutrients to the eye. These blood vessel growths break through the barrier between the choroid and the retina. Although one would think that more blood vessels supplying nutrients to the eye would be good, it is not. The new blood vessels grow out with scarring. Also, they leak more than normal retinal blood vessels. Finally they can bleed and blood is very harmful to the retina. Rarely patient maintain good vision with choroidal neovascular membranes (about 10 or 20 percent). Most people lose central vision rapidly who develop choroidal neovascular membranes unless they are treated. What is a Disciform Scar? Untreated, a person with a choroidal neovascular membrane will usually develop a submacular scar like the one in the photo. The scars are white because the are composed mostly of fibroblasts. Subretinal scars cause degeneration of the overlying retina and loss of vision. The scars are circular or disc shaped and therefore are called disciform scars. They cause vision loss because they block the transport of nutrients from the supporting tissue under the retina (the retinal pigment epithelium) which is vital to the survival and function of the retina. Unfortunately, once the retina has been permanently damaged by a submacular scar it cannot be resurrected. Retinal tissue does not regenerate. It cannot be replaced. Research is being pursued all over the world trying to find a way to fix damaged retinas, but nothing, at the moment (January 2015) is close to being effective. A hallmark of wet AMD is subretinal fluid. This comes from leaking abnormal blood vessels under the macula. Their is not a firm attachment between the retina and the underlying retinal pigment epithelium. The retina is held in place against the underlying retinal pigment epithelium by a pump in the retinal pigment epithelium. This pump removes naturally occurring fluid in the subretinal space and keeps it dry. The leakage from a choroidal neovascular membrane overwhelms the natural pump in the retinal pigment epithelium and subretinal fluid accumulates. The subretinal fluid distorts the retina causing patients to see things as wavy instead of straight. It also decreases the supply of oxygen and nutrients to the retina and makes the vision blurry. 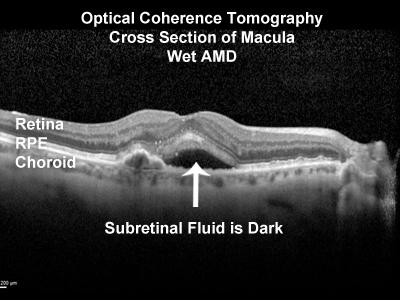 Subretinal fluid is best dectected using optical coherence tomography. 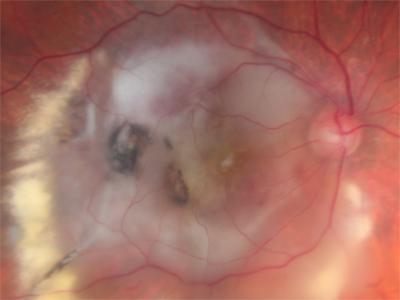 The photo shows a dark area under the retina where subretinal fluid has accumulated. 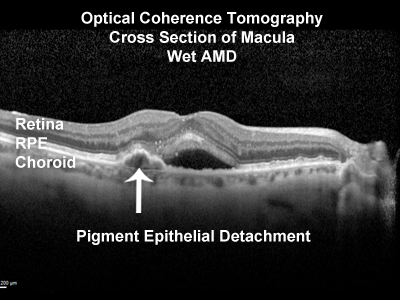 The effect (or lack of effect) of treatments for wet macular degeneration is usually evaluated by monitoring the optical coherence tomography scan for subretinal fluid. What is a Pigment Epithelial Detachment? Most patients with wet AMD develop a retinal pigment epithelial detachment. The retinal pigment epithelium is a layer of cells under the retina that supports the retina. In the OCT image it is the bright white line closest to the bottom of the picture with RPE on top of it. (there are two lines, the line on the bottom is the RPE, the line on the top is the back of the retina). When fluid or lipid (fatty material) or blood vessels accumulates under the retinal pigment epithelium the retinal pigment epithelium is pushed up. The bump in the retinal pigment epithelium is called a pigment epithelial detachment. These are common in wet AMD. Treatment does not always cause the retinal pigment epithelial detachment to flatten. Vision can be excellent over a retinal pigment epithelial detachment. The distortion of the overlying retina will often cause distortion in the vision. Retinal pigment epithlial detachments do not compromise the ability of the retinal pigment epithelium to nurish the retina. Finally, you can develop a retinal pigment epithelial detachment without wet AMD. These retinal pigment epithelial detachments have lipid (fatty) material in them but no blood vessels. About 90 percent of retinal pigment epithelial detachments are associated with wet AMD and abnormal blood vessel growth. What is a Polypoidal Choroidal Vasculopathy (PCV)? Polypoidal choroidal vasculopathy is a subtype of wet AMD that is caused by a mature vascular complex under the retina. It is characterized by a branching vascular network with one or more polyps at the termini of the vessels. The branching vascular network and the polyp(s) are best seen with indocyanine green angiography. There is some evidence the polypoidal choroidal vasculaopathy (PCV) is less response to anti-VEGF injection therapy than other forms of wet AMD. In many cases photodynamic therapy is helpful in treating PCV. What is a Submacular Hemorrhage (Blood)? Submacular hemorrhage (blood) is one of the most feared complications of wet AMD. The blood is toxic to the overlying retina and causes immediate severe vision loss. The photo shows blood in a patient whose vision dropped from 20/30 immediately to 20/1600 (no longer able to see even the big letters on the visual acuity chart). Fortunately, submacular hemorrhage is rare and occurs in only about 1 percent of patient with wet AMD. Once there is a submacular hemorrhage, vision almost never returns to what it was before the bleed. Treatment of wet AMD helps reduce the amount of vision loss. 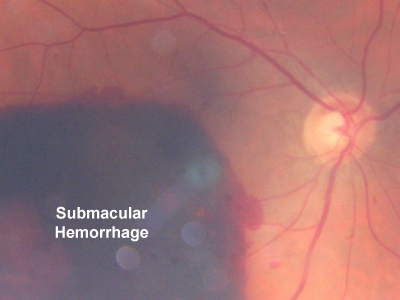 Surgery for submacular hemorrhage is controversial and may not be helpful. Visual recovery in someone with a submacular hemorrhage is very very slow. It usually takes about 6 months for the blood to absorb and then another 6-12 months for the overlying retina to heal. Vision usually improves some as the blood absorbs but not much. Most patients recover enough vision to see the big letters on the visual acuity chart but not enough vision to read. The humanized single-chain antibody fragment could become the first of its kind approved for the common eye condition. Researchers have found that an experimental drug may be twice as good at fighting vision loss as previously thought. Allergan has chalked up some flattering safety data for abicipar as it refines the eye drug's manufacturing processes in preparation of an impending BLA filing. Under priority review status, the FDA accepts Novartis' (NYSE:NVS) marketing application seeking approval for brolucizumab for the treatment of wet age-rel. Enrollment of U.S. patients in the ONS-5010-002 Phase 3 clinical trial expected to be initiated in calendar Q2 2019. 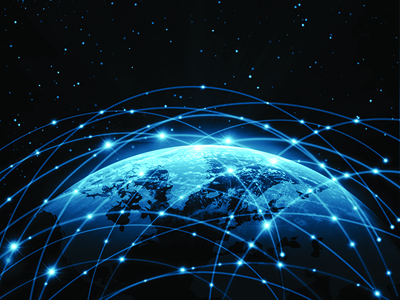 Company to Host Investor Conference Call Today at 8:30 a.m. EDT / 5:30 a.m.. Wet Macular Degeneration Market report covers the disease overview, definition, classification, symptoms, ethology, pathophysiology and diagnostic methods. NIH researchers have pinpointed 6 genomic regions that are closely associated with the development of age-related macular degeneration. (Pixabay). PHILADELPHIA (KYW Newsradio) — There may soon be a way to preserve your vision with a lot less hassle. Your chances of getting this top cause of vision loss in people age 60 and older—depends on both your genetics and your lifestyle. Wills Eye Hospital has helped test an implantable delivery system for a widely used medication for age-related macular degeneration.